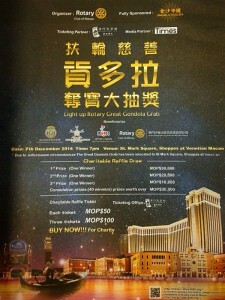 Light Up Rotary Gondola Grab Lucky Draw Ceremony venue on Dec 7 , 2014 at 7 pm will be changed to St Mark Square, The Grand Canal Shoppes at Venetian Macao. For our Dec 7 gondola grab Lucky draw ceremony, we are relocating venue from outdoor lagoon to St Mark Square , The Grand Canal Shoppes at Venetian due to maintenance work at lagoon. From today, we have put up advertisements in macao daily times and Chinese newspaper to advise venue change.